Head and Body Lenght : Males : 78 cms (2.5 feet). Very much a langur in shape and build, Nilgiri Langur are a glossy black all over. The hair on their head is a yellowy brown and the glossy black face gives it the appearance of being fringed by a halo of the same yellowy brown colour. Females have a white patch on the inside of the thighs which is also present in young females, but not easy to see, since unlike the Common Langur the Nilgiri Langur are shy, retiring and occupy a dense forest habitat. The young have pink skin and are covered with rich brown hair. While habitat loss has been a major factor against them, the Nilgiri langur is perhaps the most hunted of India's primates and is killed for its fur, flesh and body parts which are said to contain medical properties. This has also resulted in this monkey being extremely wary and shy. A species endemic to the Western Ghats, this monkey is mainly threatened by the destruction of its habitat. Some good places to see this primate are the Anamalais (Indira Gandhi) Wildlife Sanctuary in Tamil Nadu and its neighbouring contiguous Parambikulam Wildlife Sanctuary in Kerala, Periyar Tiger Reserve also in Kerala and the Kalakkad Mundanthurai Tiger Reserve in Tirunelveli District of Tamil Nadu. It is widely distributed through the Western Ghats and not just confined to these Parks. The favourite haunts of the Nilgiri Langur are the sholas, which are dense evergreen forests occupying the watercourses or folds in high elevation grasslands. It can be found even at elevations of 7000 feet (2135m) and is not generally found below 3000 feet (915m). In the lower elevations, it inhabits the wet evergreen forests where the canopy is about 60 m in height, and also utilises the mixed deciduous forests in such areas. 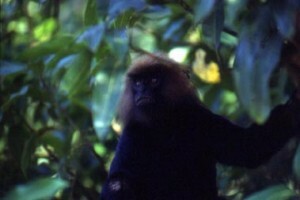 Much more arboreal than the Common Langur (Semnopithecus entellus), it is seen on the ground on rare occasions in these forests. In the sholas however, they are often seen bounding across the grassland from one shola to another. Langur spends about 7-8 hours feeding. Early mornings, especially in winter, finds the Nilgiri Langurs sunning themselves on the topmost branches. Feeding is a primarily morning and late afternoon activity and the middle of the day is reserved for activities such as grooming, play amongst youngsters and sleeping. Grooming is not such a major activity amongst Nilgiri Langur, though a fair amount does take place, mainly amongst the adults. Like the Common Langur, the whooping call of the Nilgiri Langur is very distinctive though quite different in its resonance. Normally the whooping call of one male elicits similar booming whoops from neighbouring males and soon the forest seems to echo with these calls. For those who have heard this, these sounds epitomise the early morning hours in the forests of the Western Ghats. The average troop size of 8 -9 animals is more the norm though lone males and all male groups of 3 -4 individuals are often sighted. Some bisexual groups can include as many as 25-30 individuals with a dominant or alpha male as the leader. While there is a distinct home range, this varies from region to region depending on the size of the troop, type of habitat and availability of food. Young ones have been recorded in June and in September, but the number of births in June seems to be greater. 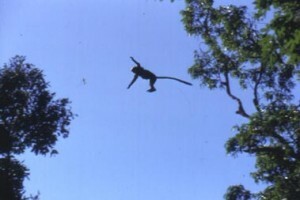 The infant is carried upside down clinging to the mother's belly while she leaps 3-7 m through the canopy with ease. Once the infant is 10 days old, its mother allows and even encourages it to be handled by other females thereby giving the mother more freedom to feed. Occasionally, a female is found 'baby-sitting' 2 - 3 infants for a short period of time. When the infant is 3-4 months old it starts to include solid food in its diet and at about the same time, the mother starts to leave the infant alone thus forcing it to become independent. At the age of 1, the infant is totally weaned and almost fully independent. The infants commence playing with each other at the age of 4 months, and continue this activity daily until they are 4-5 years old. Play consists of chasing, wrestling, biting, slapping and is almost always amongst the youngsters. Mothers may sometimes be passive playmates, while adult males do not indulge in this activity at all. Adult males also show little interest and keep their distance from the young ones until they are about 12-15 months old. Hohmann, Gottfried and F. S. Wesley Sunderraj 1990: Survey of Nilgiri Langurs and Lion-tailed Macaques in Tamil Nadu, South India - Primate Conserv. ; No. 11. p. 49-53. Ali, Rauf; J. M. Johnson and Jim Moore 1985: Female emigration in Prebytis johnii: A life history strategy - J. Bombay Nat. Hist. Soc. ; 82(2):249-252. Hohmann, G 1989 : Group fission in Nilgiri Langurs (Presbytis johnii) - Int. J. Primatol. ; 10(5):441-454.